Five years ago the University of Oxford estimated that there were 120,000 children in the UK, 65,000 of whom were born here, who were ‘undocumented’ – living here without a regular immigration status. A new CCLC report, ‘This is my home’, examines what is happening to this group of children. Thousands of undocumented children and young people will have grown up in the UK, been educated here, will think of themselves as British. Many grow up in the UK without realising that immigration is even an issue, their lack of regular status only becoming evident when they wish to work or access further or higher education. Because a person who is undocumented in the UK cannot work, cannot access mainstream benefits, is effectively barred from college and university cannot open a bank account or hold a driving licence. Very high application fees, with very limited fee waivers. A shorter route to permanent status for long-resident children and young people with lower application fees. An urgent review of children and young people’s needs for legal services and at least the reinstatement of legal aid for separated children’s immigration cases. Better information for social workers and improved local authority practice through training and designated social care leads. As Brexit negotiations commence, and we wait to fully understand the fate of EU children and families in the UK, it is more important than ever to ensure that children and young people who have grown up here are able to have secure status and build their futures in this country. Read the full report and the executive summary. 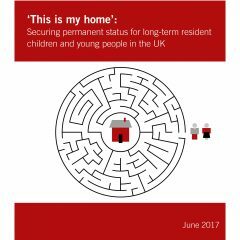 Read the companion paper ‘Securing permanent status: existing legal routes for children and young people without leave to remain in the UK’. Read our briefing ‘A settlement for European children in the UK’.